Using a variety of theoretical frameworks drawn from the social sciences, the contributions in this edited collection offer a critical perspective on the dominant paradigms used in contemporary financial activities. Through a detailed study of the organisation and functioning of financial intermediaries and institutions, the contributors to this volume analyse ‘finance in the making’, by shedding light on the structuring of banking and financial systems, on their capacity to prescribe action and control, on their modes of regulation and, more generally, on the process of financialisation. 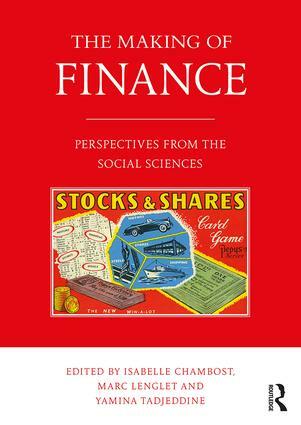 Contributions presented in this volume have been written by authors working within the ‘social studies of finance’ tradition, a research programme that emerged twenty years ago, with the aim of addressing a diversity of financial fieldworks and related theoretical questions. This book, therefore, sheds light on different areas that are representative of contemporary financial realities. Specifically, it first studies the work of financial employees: traders, salespeople, investment managers, financial analysts, investment consultants, etc. but also provides an analysis of a range of financial instruments: financial schemes and contracts, financial derivatives, socially responsible investment funds, as well as market rules and regulations. Finally, it puts into perspective the organisations contributing to this financial reality: those developing and selling financial services (retail banks, brokerage houses, asset management firms, private equity firms, etc. ), and also those contributing to the regulation of such activities (banking regulators, financial market authorities, credit rating agencies, the State, to name a few).